This is a sample library like no other. There are electric piano libraries, there are even Fender Rhodes libraries - many of them extremely good. But this is a special case. 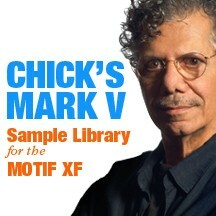 This library is based on lovingly preserved samples of Chick Corea's own personal Fender Rhodes Mark V - a model he worked on and with, with Harold Rhodes. The sample session, using a specially developed 'vorsetzer' player piano mechanism in order to capture pristinely balanced velocities across the entire keyboard scale, was conducted especially for this collection and is not available in any other format. Based on a massive 400 MB of sample data, this 12-layer collection is not looped; the full sustain of each note being maintained throughout. Part of the collection's uniqueness is the custom hammer configuration of the original instrument. At F# below Middle C the hammers were modified from the standard neoprene to wooden, creating an almost 'split keyboard' effect that lets notes in the treble register 'speak' with a clarity and punch that you simply didn't get on a standard Fender Rhodes. From the original source files Yamaha engineers have created a landmark sample library employing WXC compression that is only available on direct-from-factory ROM material; programming an additional 12 voices that illustrate the wealth of potential for your own creativity in this collection. A Demo Song is included in the file, played and retained "in MIDI" by the man himself so you can examine exactly how he voices the composition. A rare and magical collection that should be part of every serious Motif user's collection.